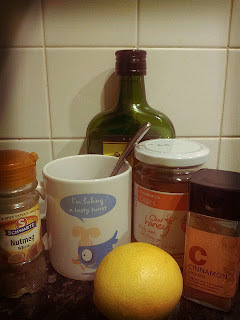 The minute I get a cold, I get a chest infection, with a full-on sixty-a-day smokers cough (I've had one puff on a cigarette once in my thirty-something years) and sinus problems and for years, my beloved grandma used to dose me up with hot honey and lemon and glycerine. I'm not sure it did anything, but there's something so comforting about that taste that to this day, I still drink it out of habit as soon as the first sniffle hits. I don't even like honey, but it's all about the memory of being taken care of. Ingredients. Finished product photo was boring! Anyhoo, I had a rubbish night last night. Both husband and child took it in turns to ensure I wasn't going to get any sleep. I'm now running on empty for the sake of keeping up my daily missives (151 posts over 148 consecutive days - I've double-blogged three times). Having been told by the chemist that they won't sell my husband any decent drugs - I only sent him for Sudafed for goodness sakes, but they acted like I'd sent him to ask for Crack and told me that I should just steam myself to oblivion (I would if I had five minutes to myself once an hour! ), I'm now testing a more traditional solution. As my dear grandma would say, it's 'kill or cure'. For someone who doesn't drink except for the odd sip on high days and holidays, I'm currently necking a brandy toddy. I did try to eat today, but save for a Cadburys Flake (I had to beg the husband for this) everything tasted bland and made me feel a bit unwell so a drink for today's recipe was the only answer. I was also recommended this course of action by the lovely @jboylie from Twitterville when I couldn't sleep at about 3am. He's on to a winner here. Thanks for the advice. Hope you feel better soon! Traditionally, a toddy is made from whisky, but all I had was some leftover brandy from the mincemeat I made at Christmas. Thumbing through the hubby's copy of the Cocktail Bible, I happened across a recipe for a brandy toddy instead. And it tastes pretty good. I'm sure it's the honey, lemon and spices that mask the alcohol flavour. I could quite get used to this alternative although my grandma would be horrified I'm turning to the bottle! Not having a cinnamon stick (I used the last one at the weekend) I just went with grated nutmeg on the top which gave it a lovely wintry feel. Definitely on the menu next time I get poorly! Place the honey in the bottom of a cup and squeeze in the lemon juice and add the brandy. Fill the mug to halfway with boiling water. Add the cinnamon stick and leave to steep for five minutes (or not if you've run out like I did). Grate nutmeg over the top and enjoy.